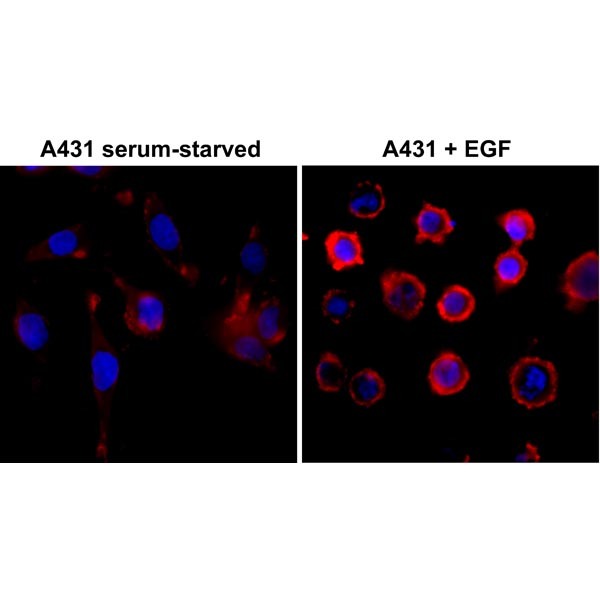 Immunocytochemistry of serum-starved A431 cells nontreated or treated with EGF, using RevMAb Clone RM111 at 1/500 dilution (followed by a PE conjugated secondary antibody, red) and DAPI (blue). 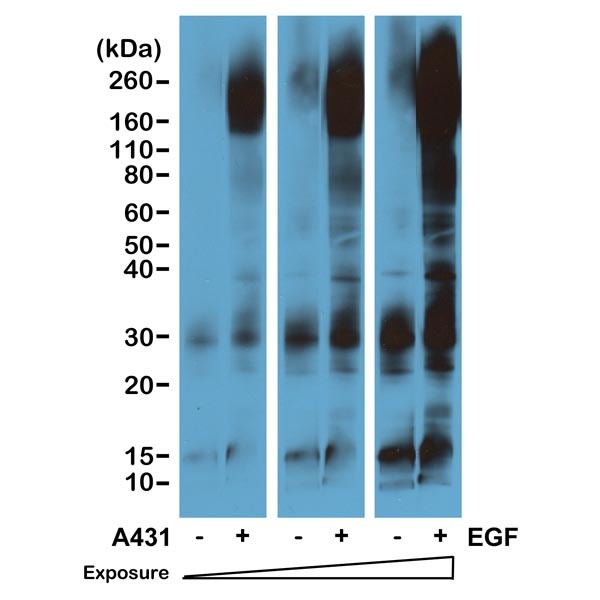 Western blot of serum-starved A431 cells non- treated or treated with EGF, using RevMAb Clone RM111 at 1/5000 dilution. The blot was exposed to the film at different time points. 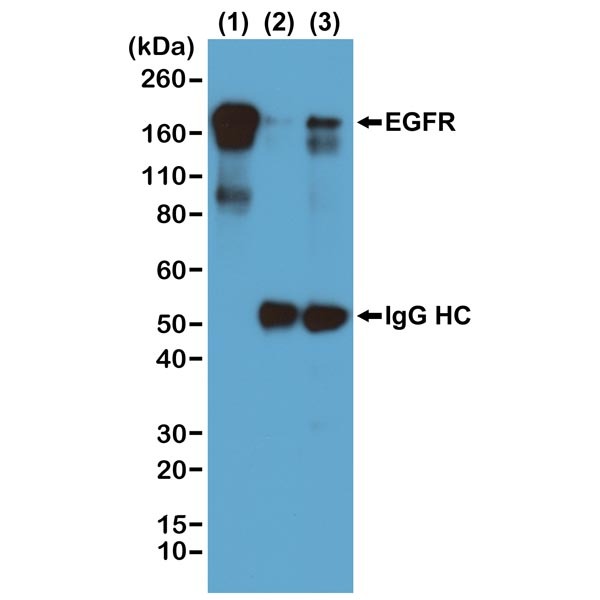 Immunoprecipitation of EGF-treated A431 cells by RevMAb Cone RM111 at 1/1000 dilution, was blotted with an anti-EGFR rabbit monoclonal antibody. (1) Whole lysate control; (2) IP by rabbit IgG control; (3) IP by Clone RM111. 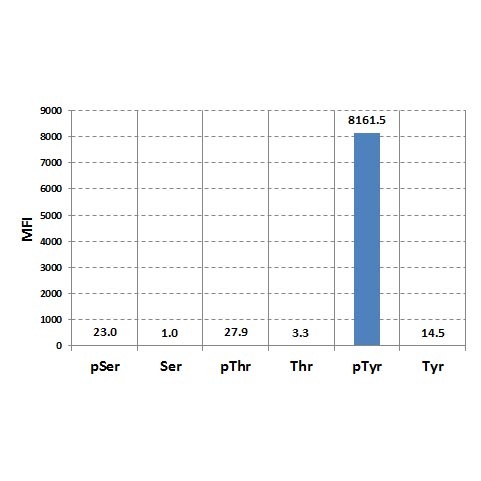 Luminex analysis of Clone RM111’s reaction against phosphorylated or nonphosphorylated Serine, Threonine, and Tyrosine. RevMAb Clone RM111 reacts only to phosphorylated Tyrosine.